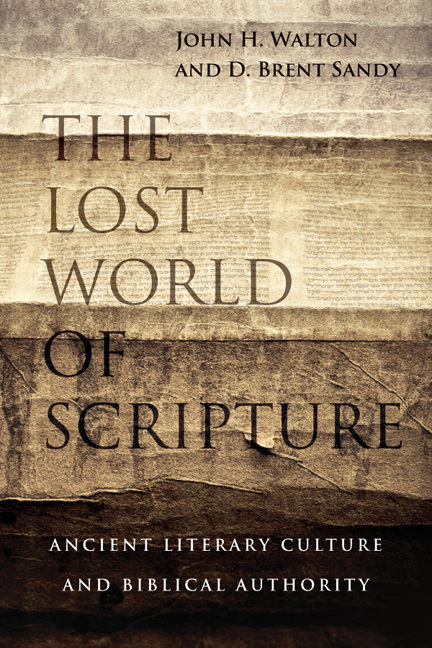 This is the final post on The Lost World of Scripture by John Walton and D. Brent Sandy. The book has been thought provoking and I highly recommend it to anyone who is struggling with the nature of Scripture as well as to those who are not. I guarantee that it will get you thinking. This isn’t the last word on the subject – but it is an excellent contribution. John and Brent conclude with a set of questions that are safe to ask. In fact, more than safe. I’d say that many are healthy and necessary to ask. It is safe to ask whether some formulations of biblical inerrancy are faithful to biblical revelation itself in the historic understanding of the church. In many cases inerrancy is formulated in a thoroughly modern way to address modern concerns. We can safely question these formulations. John and Brent again “affirm biblical inerrancy properly understood.” (p. 306) But this commitment does not require blind assent to every formulation out there. Even the Chicago statement must be nuanced and reconsidered (my point – not John’s or Brent’s). It is safe to ask whether doctrinal discussions regarding the authority of Scripture should focus exclusively on written texts. There are two aspects of this. One has to do with our understanding of the text. The oral history is imprinted on our Bible and causes it to deviate from our expectations based on a print based culture. The idea of inerrant original manuscripts is an unnecessary and unrealistic expedient. In addition, John and Brent wonder if we have erred in emphasizing the authority of printed texts…”we wonder whether tying authority strictly to written texts is rooted in print culture and misrepresents the evidence from Scripture.” (p. 307) It may not be coincidental that the doctrine of sola Scriptura came on the heels of the printing press. Martin Luther was born in 1483, less than 20 years after the death of Johannes Gutenberg and 30 years or so after the famous Gutenberg Bible. It is safe to ask about variants because they do not necessarily constitute errors as understood in the cultural context of the original communication. Imposing modern expectations on Scripture is detrimental to the church and the Bible itself. Both skeptics and Christians find the conflicts and contradictions troubling. Unreasonable expectations can set our youth up for failure and for loss of faith (something John and Brent deal with at Wheaton). What kind of foundation are we providing? Basically, modern Western lenses can make it appear that the Bible contains errors. The error, however, is with us not with Scripture. It is safe to ask how the body of Christ would best be served by our formulations of biblical authority. We do ourselves no favors by introducing unnecessary stumbling blocks. It is safe to ask what constitutes a robust evangelical doctrine of biblical authority. John and Brent don’t have a concise definition to offer. They do have some starting points however. (1) A high view of the authority and inspiration of Scripture is essential. (2) New information can lead us to question longstanding expressions of biblical authority. (3) God worked (and works) through people. (4) We should work to overcome our cultural preconceptions (i.e. print culture vs. oral culture). (4) We should not expect a clear concise answer anytime soon. John and Brent hope that we will join them in the search for a biblical worldview of authority. (p. 309) It is an important quest. Although we should not formulate our doctrine of biblical authority as an apologetic, we should consider the impact our view has on the faith and on Christians who confront the views of skeptical scholarship and the strength of evidence behind some of them. We do no favors by building a house of cards that will not stand. What questions are safe to ask? If you wish to contact me directly, you may do so at rjs4mail[at]att.net. You may also comment on Safe to Ask? at Jesus Creed. This entry was posted in Bible, Inerrancy and tagged D. Brent Sandy, John Walton. Bookmark the permalink.